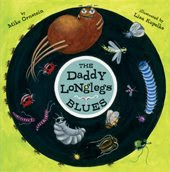 THE DADDY LONGLEGS BLUES written by Mike Ornstein and illustrated by Lisa Kopelke is just too darn cute. I had a great time reading it to my son because it has a catchy rhythm, and I'm pretty sure he had a great time listening to it too. I found myself reading it with a very deep voice and almost a jazz-like tone -- the book just lends itself to this, I swear. My son thought the book was hilarious! I just liked the overall look of this book. The illustrations are precious; and that says a lot since most of the pages have bugs and spiders on them. And I really liked the easy-to-read font and how it appeared in different sizes and different angles. There were few words per page along with bright big pictures so I think even the most active preschooler could sit through the entire story. Another thing I really enjoyed about THE DADDY LONGLEGS BLUES is that it was actually educational. In the back of the book, the author has a glossary of blues terms -- I even learned a thing or two. In addition, there was a list of musical instruments played by Daddy Longlegs with descriptions of each one. And last but not least, there was a page devoted to explaining Daddy Longlegs spiders. Since I know almost nothing about Daddy Longlegs, I admit that I did find it rather interesting. Plus, I think all of the pages in the back even make this book useful for classroom reading and classroom instruction. I definitely recommend THE DADDY LONGLEGS BLUES. It's hard not to love Daddy Longlegs and his bluesy beat! Thanks to the publisher for sending me a copy of the adorable book. The cover of that book is just adorable! I know nothing about Daddy Longlegs, so I might need to read it too. OMG! This one sounds too cute. I'll have to look for it next time I'm at the library. I love the blues aspect and the instruments. I love that someone is trying to teach kids about the blues. I'm definitely looking for this one (to give to my husband - heh heh) Great review! What a fun sounding book. I may have to read it myself. This looks great! Did it come with a CD so you can hear the music and sounds you're reading about? This is a GREAT book. I ordered it a couple of weeks ago from BN.com and my kids (6-1/2 & 1-1/2) love it so much that they have me read it over and over! Very catchy writing, vibrant illustrations and educational too. I totally recommend!